The Calgary Flames are a professional men’s ice hockey team based in Calgary, Alberta, Canada. 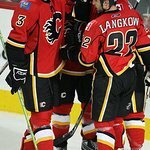 Through the team’s non-profit charity, the Flames Foundation, the team has donated over $29 million to causes throughout southern Alberta. Along with the Rotary Club, the Flames are helping to fund the first children’s hospice in Alberta. The Flames are also close partners with the Alberta Children’s Hospital. Google trends for "Calgary Flames"
We don't have any videos related to Calgary Flames.